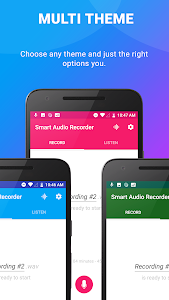 This is the audio recording application that needs to be available on your phone, Voice Recorder helps you to record audio in a professional and easy way right on your phone. 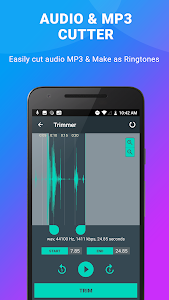 Use this sound recorder and editor app to record meetings, speeches, lectures, songs with high quality and more! Assist in recording lectures and lessons with clear quality, even if the teacher is not near you. Hear and record important knowledge to help you get to hear and learn back to the upcoming exam with professional sound recording. It is not limited to recording time and is very easy to record lessons and lectures long with mp3 voice recorder. 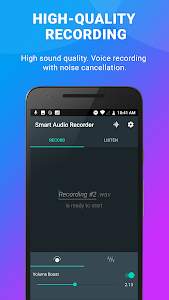 Record your interviews and meetings from your phone with record bluetooth audio, record phone conversations with noise reduction for recorded audio. Then share them with your colleagues via email or your favorite messaging application, record conversations in a meeting. Make use of the widget and shortcut powerful to start new recordings right from the Home screen. 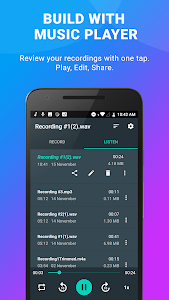 With a wide variety of options for refining recordings, this audio recorder for android is useful for rehearsal and audio-visual sessions. Quickly try new ideas, hear the results and make new changes. You can quickly switch between voice recorders, meetings, lectures, music and sound rough with settings and extremely easy to use presets. 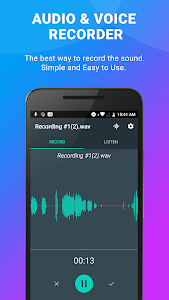 With this audio recorder and editor software you can record sounds from your phone. 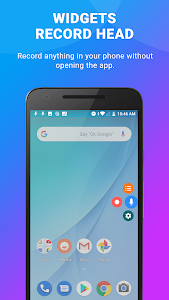 This application also supports voice recorder with noise cancellation, voice recorder volume booster. 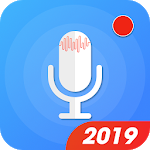 Karaoke voice recorder app, sound recorder convert to mp3, sound record and edit. - Record in MP3, FLAC (PCM), high quality WAV, good quality AAC (m4a/mp4) and AMR (3gp) to save space. - Voice recorder samsung, audio recorder for samsung. - Supports many options including: stereo, silent skip, volume boost, custom bitrare, sound recorder amplifier and more. - Karaoke recorder with high quality, karaoke music recorder. - Best quality audio recorder, good quality sound recorder. - Pause recording when an incoming call with sound record software. Thank you for using voice recorder good quality for easy to use audio recorder, rewarding, dependable, fast, flexible and suited to every object's needs. Let's rate 5 * to support us and voice recorder free download. - Add languages: Vietnames, Japanese... more languages coming soon! Similar to "Voice Recorder & Audio Recorder, Sound Recording"